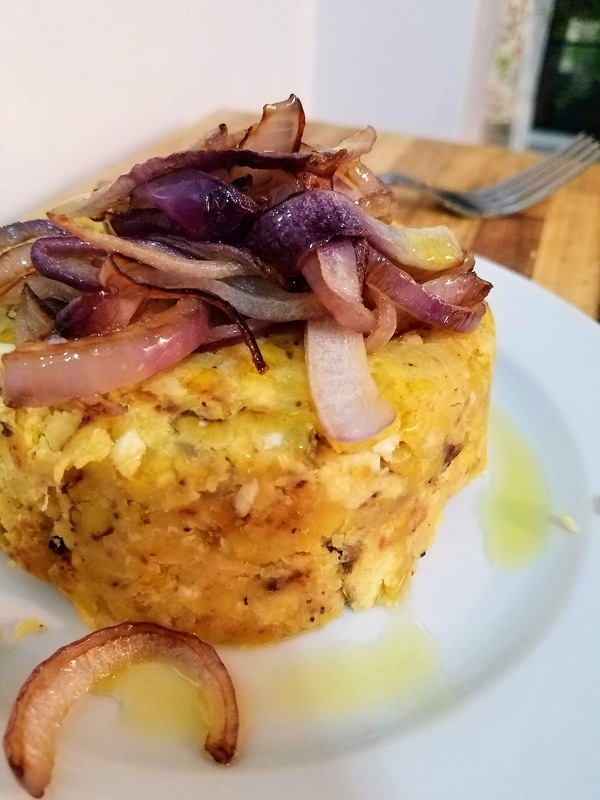 Every time I go to Puerto Rico, I have to have some mofongo - a delicious dish of mashed plantains. I have a cookbook of Puerto Rican dishes, which is for the most part heavily meat-centric, but I seriously LOVE the section on plantains. 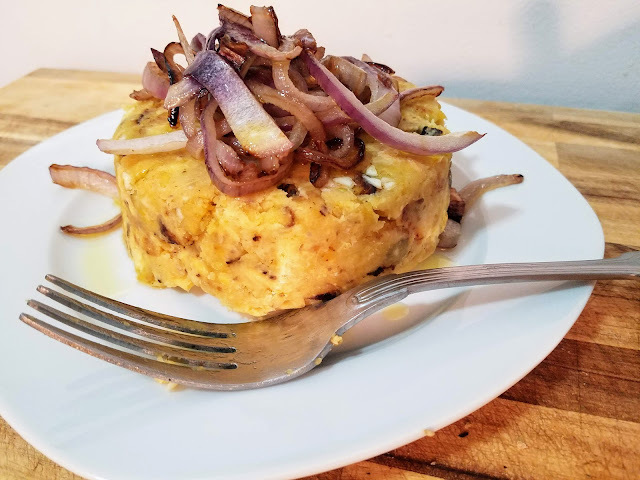 Mofongo is typically flavored with chicharrones or pork rinds, but I omitted those in my vegan version and replaced them with a few crispy fried onions for the texture and saltiness. 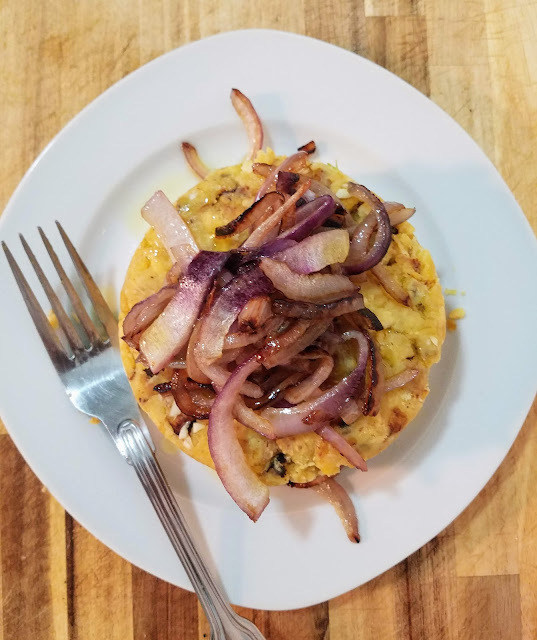 Caramelized red onions pair perfectly with this salty savory mofongo, and add a bit of beautiful color as well! This could be your main dish for breakfast, lunch, or dinner, or could act as a side dish with rice and beans. Serving this dish makes me feel like I'm on a tropical vacation and should be drinking a piña colada! 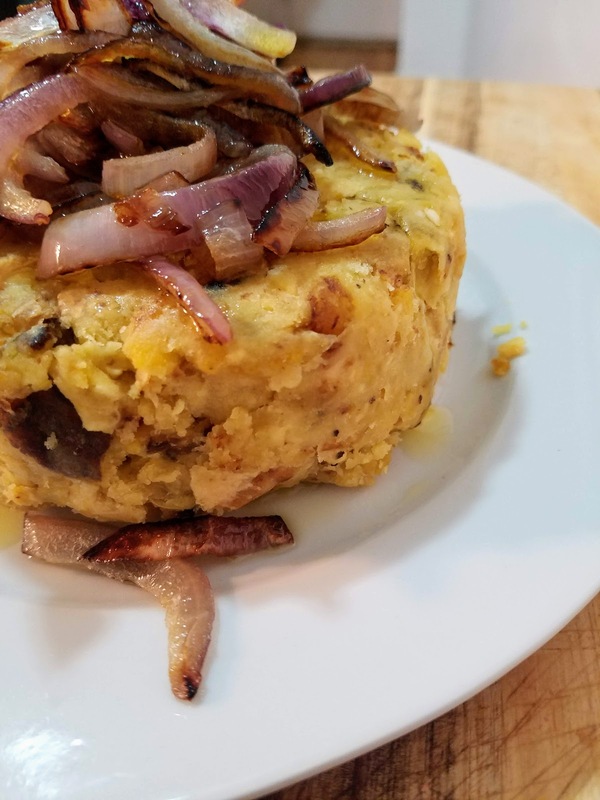 If you haven't cooked with plantains before, they are really easy to work with. The trickiest part is peeling the green plantains, but don't worry, I include tips for that in the recipe instructions. If you have a mortar and pestle, you'll want to use that for this recipe, but if not, a regular mixing bowl will work just fine. To peel plantains, top and tail the plantains, and then score the rind long-ways in several places. Under warm running water, run your fingers under the scores to loosen the rind. It should peel away easily after being loosened under the warm water. Cut the plantains into one inch pieces. Coat a skillet with vegetable oil and heat over medium high heat. When the oil is hot, add the plantain pieces and fry on each side for 3-4 minutes or until deep golden brown. Remove from oil and drain on paper towels. Meanwhile, in a medium skillet over medium low heat, add 1 Tbsp olive oil and red onion slices. Cook until brown and caramelized, stirring occasionally. 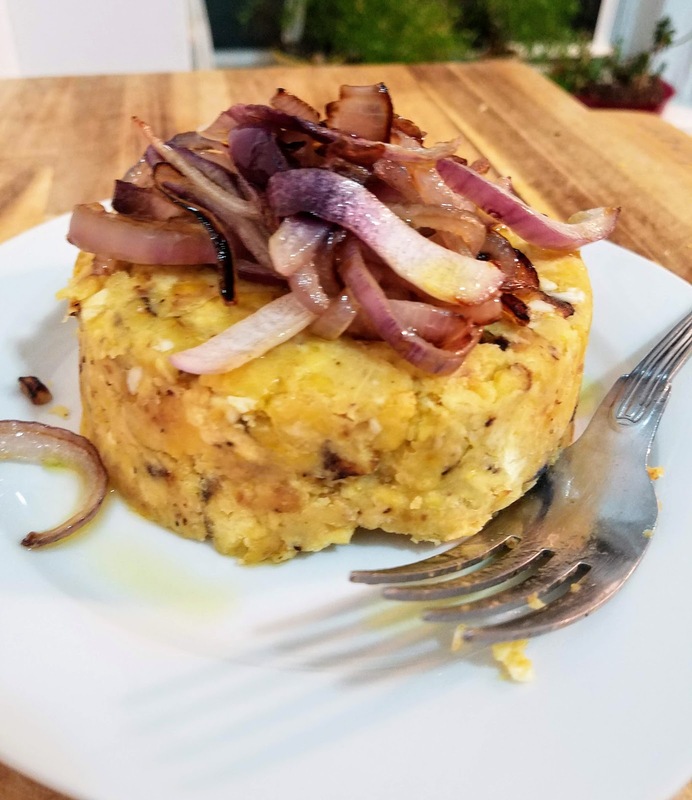 In a mortar and pestle, or in a large mixing bowl, add fried plantains, garlic, fried onions, and salt, and add olive oil and vegetable stock a little bit at a time as you mash everything together; keep adding more liquids until the mofongo comes together and is a bit moist. If using a mortar and pestle, push firmly into the base to form a dome shape (otherwise, mold the form with your hands or with a small bowl). Flip over onto a plate and top with caramelized red onions and another drizzle of olive oil. Serve immediately.